The population of the nation—and the Wood River Valley—is aging. Though Blaine County has several organizations dedicated to caring for seniors and the elderly, senior care specialists say the county has a desperate need for assisted-living facilities. And while the organizations have traditionally focused solely on their individual missions, they have started coming together to find a solution to the problem. 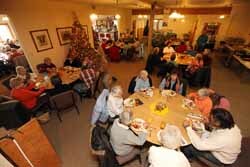 "Our absolute biggest need is for assisted living," said Kim Coonis, executive director of the Senior Connection in Hailey. "I had two phone calls today from people in assisted living in other areas, and I couldn't even recommend something here for them." Coonis said this situation occurs at least once a month, when she sees seniors in the community who don't need skilled nursing—just a little observation—leave the valley in search of a facility that can help them. The difference between assisted-living facilities and skilled-nursing homes is relatively simple, said Gail Goglia, chief administrator for Blaine Manor, the county's skilled-nursing home in Hailey. "The best way to say it is that they are in much better shape," Goglia said of seniors who need assisted living. While these residents may have difficulty remembering medication, bathing or cooking, they can perform most daily activities unaided. Skilled-nursing residents are "much more frail," Goglia said, and could require round-the-clock nursing care, as well as rehabilitation and close medical observation. Goglia said she, too, gets calls from seniors looking for assisted-living facilities. "There are people that need help, but not as much help as we provide," she said. "They want to be able to keep their independence," which isn't possible at Blaine Manor. According to Coonis and Goglia, roughly two-dozen senior residents leave the valley every year because of the gap in the county's facilities. Blaine County Commissioner Angenie McCleary, who has been leading a series of workshops on senior care in the area, said the loss of these residents harms the valley, and that the county should do right by its aging residents. "My goal is for Blaine County residents to be able to stay in Blaine County," she said. "They should have the options and resources to do so." The Senior Connection, by all accounts, is doing its best to fill this gap. Organization volunteers logged 30,000 hours of in-home care this year, helping cook for, bathe or otherwise aid seniors in need of additional care. But Coonis said many of the residents she sees need more than occasional help. "We see when people aren't safe in their homes," she said, mentioning as an example seniors who are struggling with early-onset Alzheimer's or dementia. "There are a lot of people who know they aren't safe—they're afraid to be home alone at night." The isolation of old age is a major concern, said Kathleen Eder, executive director of the Croy Canyon Ranch Foundation. The foundation is dedicated to building a tiered-care facility in the valley that would provide independent senior living, assisted living and skilled-nursing facilities for older valley residents. When the Blaine Manor Levy was passed in 2010, meant to keep the skilled-nursing facility solvent for three years, county commissioners looked to the Croy Canyon Ranch as an eventual replacement facility. The private complex would be self-sustaining, with revenue from assisted-living and independent residents helping to fund the cost of nursing that the more frail residents would require. But before starting construction, the foundation must raise $13 million, of which almost $3.9 million has been pledged. Though Eder was hesitant to give a timeline on when construction could begin, McCleary said it would not likely be built before the levy expires in 2013. "That's not being pessimistic," McCleary said. "It's reality. I won't say [Croy Canyon Ranch] isn't happening, but it can't be the solution for right now." Eder did say the original plans called for construction to begin in spring 2012, a date that has since been pushed back due to lack of funds. "We'd love to be working on building in the spring, but that's not happening," Eder said. "We need something in the interim." With no solid solutions in sight, the organizations say they will have to work together to solve the gaping hole in senior care in the county. McCleary said she's optimistic that now that the organizations have found a common goal to work toward, a solution will be forthcoming. "If we can work together, we're so much more effective," she said. Coonis, Goglia, Eder and McCleary will conduct at least one joint meeting before the county begins discussing its role in providing senior care and a possible interim solution. McCleary said the county's discussion will likely occur in January, and the commissioners will solicit and welcome public comment on the issue. In the meantime, the foundation will continue to raise funds for Croy Canyon Ranch. When asked if McCleary's fears that the facility may not open before the levy expired were justified, Eder said the organization hoped to raise $4 million by the end of the year. "We're optimistic," she said. "We'd like to give [McCleary] a reason not to have to worry."